1993 Mercedes-Benz 300CE - Any Mercedes 300CE would be a nice car to own. They are well engineered, well built cars. This car was in the movie “The Firm” starring Tom Cruise. The seller states that he has a letter from Mercedes Benz confirming that the car was used in the movie. In addition to the letter from Mercedes Benz, he contacted the product placement company that represented Mercedes Benz. The product placement company confirmed that this is one of cars used in the movie. I am a notorious non-movie buff. I have seen maybe 30 or 40 movies in my life. "The Firm" wasn't one of them. I would consider buying this car based on its 81,000 miles and overall nice condition. But, if you're Tom Cruise fan or looking for a way to start a conversation, this car's "movie star" status is a bonus. 1967 Sunbeam Arrow - The Sunbeam Arrow was, for all intents and purposes, the Rootes Group's last gasp in the US. (The Hillman Avenger was sold in the US, but it was badged as the Plymouth Cricket.) Introduced in 1966, it was a simple, fairly comfortable and easy to work on. Rootes / Chrysler built it through through 1979, but it lived on as the Paykan in Iran through 2005. (Peugeot bought the Rootes Group from Chrysler in 1979 and later Paykans used Peugeot engines.) This is a rare car in the US. A the seller mentions, just 137 found were sold in here. The seller (or someone before him) did some engine work to this car. He says it is now tuned similarly to the engine found in the Sunbeam Rapier H120. The Rapier H120 had performance numbers similar to Lotus Cortina. If I were to buy it, I'd restore the body and interior and throw on a set of Minilites. It would be a great weekend driver and a truly unique car at any car show. Located in Ames Iowa, click here to see the eBay listing. The GTA, while sharing a lot with the Alliance, was an impressive car. While the stock 1.4 liter Alliance took over 14 seconds to reach 60 MPH, the GTA, with a 2.0 liter engine in it, took just 9 seconds. The GTA could handle, too. It came with 195/50 VR 15 Michelin XGT tires on 15x6 alloy wheels (15" 50 series tires were not all that common in 1987). The suspension included gas struts & shocks and a thick front and rear sway bar. According to figures published by Car & Driver, the 1987 GTA pulled the same skidpad numbers as a 1987 Corvette. Because of its connection to the unloved Alliance, GTAs can be purchased for next to nothing these days. 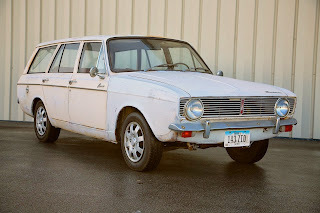 This one, which looks to be in great shape and has had some minor mods done, has an asking price of $3000.00. No one, with the exception of a few car geeks, will give you any respect for owing a a GTA. But, you can be satisfied in knowing you have a fun car - one that can run with the best of the 1980s hot hatches - and you paid next to nothing for it. Located in Jamestown, NY, click here to see the Craigslist ad. A big thanks to JaCG reader, Stephen, for sending me the link to this GTA. This reminded me of the Seinfeld Episode with the Jon Voight Car. 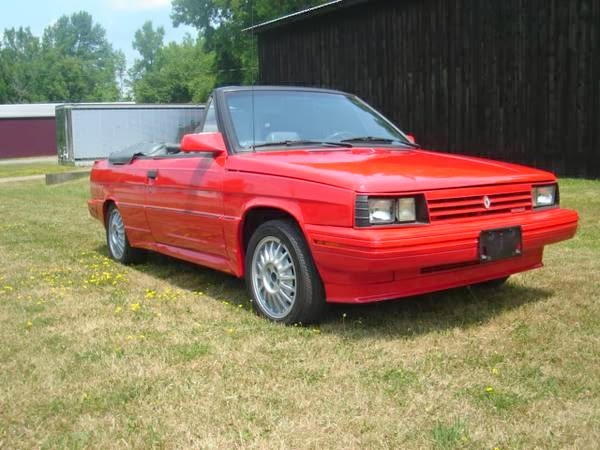 An 80's K-Car Chrysler Town and Country Convertible. Clearly someone has it far worse for obscure British cars than I do, and likes getting them going mechanically and then passing them along. Needs Rostyle wheels for the sporting Hillman look. I owned the non-GTA and it was the nicest riding car I ever owned of all my pocket rockets. I WOULD jump on this car for a daily driver. But in all my research, the unavailability of parts is the unfortunate killer. I maybe wrong, and I hope so. Truly, before I wrecked the motor due to the timing belt, it was my favorite car. In my ignorance I grew up with changing timing chains, and did not know about the modern tech.